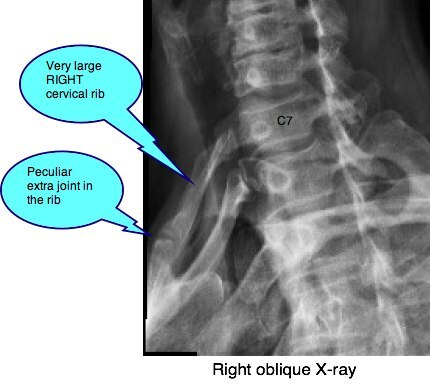 Cervical rib casefile shows the rudimentary structures are usually of little clinical significance but occasionally they are enormous causing disturbing tingling in arms and hands. This page was last updated by Bernard Preston on 4 December, 2018. The inter Scalene Triangle is a small passage in the lower neck through which the artery and nerves to the arm pass. In two persons per thousand an extra structure may be located in the passage, viz an extra cervical rib. In most instances cervical ribs are small structures of little clinical significance. However, very occasionally, they may be enormous having an influence on either the subclavian artery, or the brachial plexus of nerves, or both. Hence the symptoms can be very variable; vascular and neurological, depending which trunk of the brachial plexus is affected. It could influence the thumb, the little finger side, or all the fingers. Claudication is a condition where there's sufficient blood for the muscles at rest, but as soon as there's increased activity, there's inadequate oxygen for the muscles; a deep ache develops. Angina is a similar condition in the heart, as is vascular intermittent claudication in the leg causing pain when walking or cycling, but not at rest. In short, in a cervical rib casefile there may be a crazy mixture of vascular and neurogenic signs and symptoms. 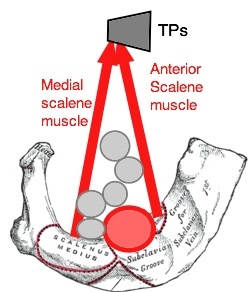 Originating from the C7 transverse process and passing through the inter scalene triangle before attaching firmly to the first rib a Cervical Rib can severely interfere with the normal function of the arm. What is mysterious is that the cervical ribs are usually quiescent for many years until some event like a car accident or bad fall starts the radiating pain and tingling in the arms and hands. They symptoms are very variable, depending on whether the artery primarily is affected, and which trunk of the brachial plexus. Generally, the nerves are affected more than the artery. Classically, raising the arms narrows the passage causing what is known as a thoracic outlet syndrome. The main diagnosis for TOS usually is determined by Adson's test. The effect on the radial pulse is assessed with movements of the head, neck and arm, and breathing. It is however a very subjective procedure, and dependent on a strong heart and sufficient blood pressure. If the radial pulse is weak and thready then it's difficult to make a proper assessment. Cervical rib casefiles often cause other syndromes in the arm such as shoulder pain or carpal tunnel tingling the arms and hands. Mrs T, a 60-year old secretary consulted us complaining of an ache in her right lower arm, aggravated by holding a telephone to her ear, which she had to do for long hours every day. In the mornings she had pins and needles in both hands, right worse than left, in the first three fingers, known as the median nerve distribution. 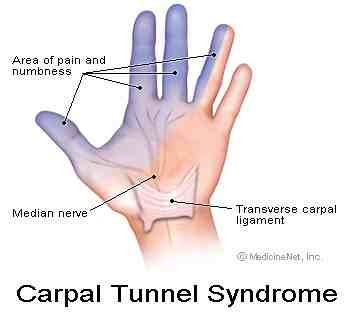 Generally one would suspect an underlying Carpal Tunnel Syndrome, which really should also affect the ring finger. Tingling in arms and hands is invariably a large component of these cervical rib casefiles; a differential diagnosis is important. Is this true carpal tunnel syndrome, for example, or a just a byproduct of that large offending appendage in the upper torso? Arm pain and tingling the hand is frequently a feature in cervical rib casefiles. She has had neck pain periodically all her life since a serious fall aged 17. Three years previously surgery for her neck was recommended, but she declined. There was no mention of a Cervical Rib. The neck pain gradually resolved of itself. Eighteen months previously she had a severe episode of right shoulder pain after yoga which resolved 90% after physiotherapy. She has a tired feeling in her LEFT upper arm. The ache in the right lower arm, and the tingling in the fingers began some 6 months previously, but was getting worse despite treatment by two different physiotherapists. Mrs T is a healthy looking, slightly built, non-smoker. Of concern, she was on HRT "in case of osteoporosis", despite the risks of stroke, heart disease and clots, breast cancer and incontinence. Scroll down for more information from the Women's Health Initiative at growing green beans - legumes are part of the solution. Range of motion of the neck was normal and painfree without referral to either arm. Kemp's test for a facet syndrome was negative, CERVICAL COMPRESSION TEST for a suspected disc injury were negative, Phalen's and Reversed Phalens for Carpal Tunnel were negative. Ranges of motion of the shoulders were normal. The Upper Limb Tension test for a tethered nerve root was negative, and all neurological tests were negative. 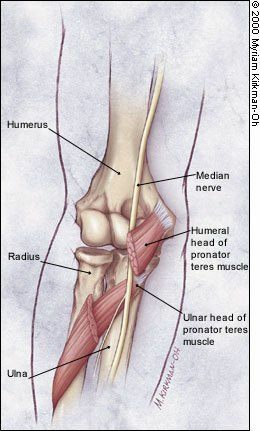 There was no pain in the Pronator teres muscles in the forearm, almost always painful in Carpal tunnel syndrome. At this stage, I was at loss. What is wrong with this lady? Then I did Adson's test and immediately struck gold. On the left, there was distinct diminution of the radial pulse when she turned her head to the left, extended her neck and took in a deep breath. The pulse returned when she returned her head to the neutral position, and breathed normally. On the right, for the first time in my whole clinical life, I COULD DETECT ABSOLUTELY NO RADIAL PULSE. ZILCH! So it was impossible to do Adson's test which is dependent on a healthy radial pulse. I traced Mrs T's history carefully, looking for anything that I may have missed, asking about other things she may have remembered, and reported to her the mysterious lack of expected findings at the first examination, with the exception of the inexplicable absence of a radial pulse in her right wrist. I then opened the X-ray folder. Marked loss of disc space at two levels in the neck. C4-C5 and C5-C6. Foraminal encroachment due to arthritis in the Joints of Luschka and a small cervical rib on the left. That explained the numb ache in the left upper arm. Minimal encroachment in the foramina on the left, confirming the less severe symptoms are being caused by the small cervical rib on the left. A HUGE right cervical rib with a most peculiar extra synovial joint, mid cervical-rib. Phase I: 6-8 treatments in the next 3-4 weeks in the initial treatment phase. Phase II: 2-3 rehab treatments. Strong recommendation that she get a telephonic headset. The first treatment of her scalene muscles and an adjustment of the LEFT first rib. I decided to start on the less symptomatic side first. Not much change. Today we adjusted the RIGHT first rib, avoiding the supernumary cervical rib. Extensive work on the scalenes, the left shoulder, the right forearm and wrist. Definite improvement in the tingling and ache in the lower arms. I "thought" I could detect a slight radial pulse after the treatment. Was I hallucinating? The power of chiropractic never ceases to amaze me. Mrs T declared today that she woke for the first time in six months without tingling in either hand. Perhaps more important, BEFORE the treatment today, she had a distinctly palpable pulse in the right wrist. The improvement continues. Sometimes there is tingling in the arms in the morning, for fifteen minutes, but the pain in her right arm has improved by at least 80%. 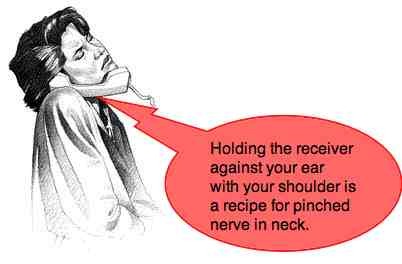 At my suggestion, she has purchased a multiamedia headset as described at pinched nerve in neck so that she does not have to raise her right arm for long periods. That too seems to be helping. A weak radial pulse is now present. At the next consultation we will begin with the rehab of her arm. It's going to be trial and error: with such a large space-occupying rib in the Inter Scalene Triangle I simply cannot be sure that exercises prescribed for most folk with neck pain will work for her. Mrs T is improving far beyond our expectations. After a two month lay off in the summer without treatment, which was not recommended, she has again that deep ache in her arm within a week after starting school. Pressure, telephone, stress, traveling in the car, and computers are doing her in; absolutely zero radial pulse once more. One of the concerns is a thrombosis as the subclavian artery and vein must be compromised in the thoracic outlet. Fortunately she's not overweight, knows all about the foods that lower cholesterol without having to be told, and has never smoked. A clot is very serious, causing the arm to swell. However, there are concerns about that HRT which does increase her risk of cardiovascular complications. 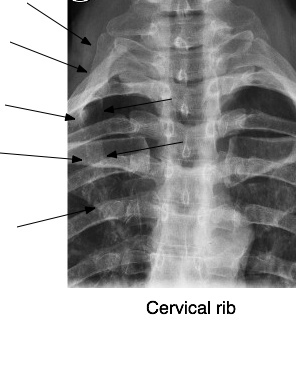 This week I had an email about another cervical rib casefile; a patient who went the surgical route for this problem. The surgery was quite successful in one arm, but the arm has been a disaster. Severe weakness and numbness in the hand; they must have nicked the brachial plexus of nerves. 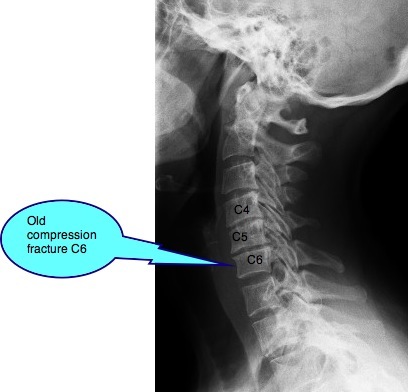 Advanced lower cervical degenerative change from an old whiplash. She is adamant she won't go for surgery to remove the rib. The right decision in my book. Some would say that's because I have a vested interest! True. But when you read the letters I receive at C-H asking for advice after a cervical rib excision that has gone horribly wrong, you'll understand my viewpoint. Bernard Preston is a semi-retired chiropractor; challenges such as this case file continue to intrigue him. Healthy choice foods are an important part of the management of these difficult cases. The nerves are coated in a fatty myelin sheath; in the absence of adequate oleic acid in the diet nerve conduction is inhibited. In addition, many of these cases are essentially arthritic in nature with large spurs threatening the nerves as they exit from the intervertebral foramina. A diet rich in coloured foods and especially magnesium is absolutely fundamental. Anti inflammatory foods such as this green chili sauce recipe and plenty of omega-3 are a great helper for all those suffering from chronic pain. And, yes, for those suffering from a cervical rib casefile.